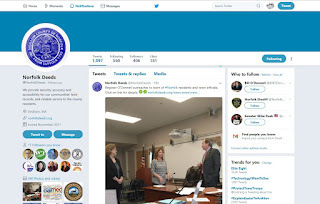 Continuing a theme of communicating directly with the citizens of Norfolk County, Register of Deeds William P. O'Donnell today reminded consumers about the various social media platforms available to them. O'Donnell noted, "A core mission here at the Registry of Deeds is to make important information readily available on a 24/7 basis. After all, just because our doors close at the end of the business day doesn't mean the Registry has to stop working for you. For example, our website www.norfolkdeeds.org lets people review scanned images of up to 6 million land documents back to 1793, as well as to learn about our latest consumer protection programs. I also want people to note that Registry information is available not just from using their workstations or laptops, but also from their smartphones and tablets." The Register also noted that you can print out an application of the popular Homestead Act, a law which provides a homeowner with limited protection against the forced sale of their primary residence to satisfy unsecured debt up to $500,000, or sign-up on-line for its free Consumer Notification System. This program will alert a person anytime a land document has been recorded or amended against their name in Norfolk County. Additionally, there is valuable county real estate information that can be researched and tracked based on the monthly and quarterly real estate statistical reports, such as the number of residential and commercial properties sold and average prices of property sold, and much, much more. Other forms of social media utilized by the Registry of Deeds include Facebook, facebook.com/NorfolkDeeds, Twitter, twitter.com/NorfolkDeeds and Instagram. "The Registry has utilized Facebook and Twitter extensively to provide information to the public. We have also begun to use Instagram which will capture the demographics of younger property owners and real estate professionals. We are optimistic that first-time homeowners will use these social media platforms. They can learn more about home ownership and other consumer initiatives like protecting themselves against Deed Scam rip-offs, along with other outreach services, including learning about Registry office hours in the community," said O'Donnell. The Registry has also filmed multiple public service announcements (PSA's) which are available on the Registry's website and YouTube. These PSA's have touched on a variety of issues such as assistance for residents who have received a Notice to Foreclose Mortgage from a lender. Videos highlighting the Registry's various philanthropic initiatives, such as its Annual Holiday Food Drive and its Suits for Success program, which helps people who are attempting to re-enter the workforce, can also be viewed. 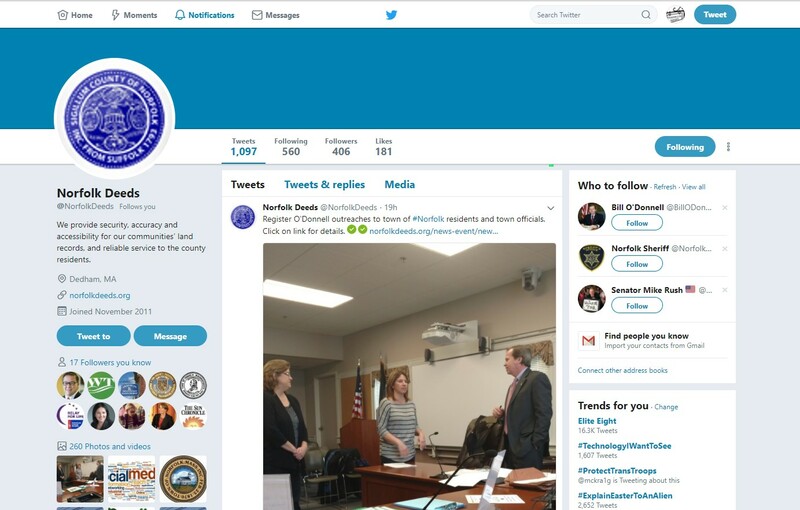 Concluding, Register O'Donnell stated, "My office recognizes the importance of using social media platforms to disseminate information. If you have questions related to real property, I urge you to take a look at our social media offerings." To learn more about these and other Registry of Deeds events and initiatives, like us at facebook.com/NorfolkDeeds or follow us on twitter.com/NorfolkDeeds and instagram.com/NorfolkDeeds. The Norfolk County Registry of Deeds is located at 649 High Street, Dedham. The Registry is a resource for homeowners, title examiners, mortgage lenders, municipalities and others with a need for secure, accurate, accessible land record information. All land record research information can be found on the Registry's website at www.norfolkdeeds.org. Residents in need of assistance can contact the Registry of Deeds Customer Service Center at (781) 461-6101, or email us at registerodonnell@norfolkdeeds.org.